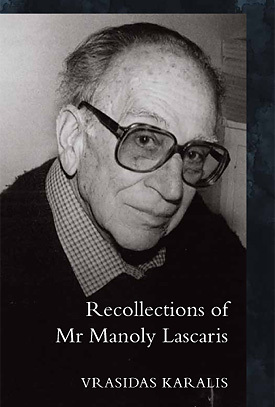 Manoly Lascaris was a truly remarkable man, a character Patrick White might have wanted to invent. Vrasidas Karalis has written of him beautifully, with great sympathy. This is an engrossing and wise book, an altogether moving experience. 'Manoly Lascaris, the lifelong companion of Nobel Prize-winning writer Patrick White, never wrote anything. "But I will die having exhausted my creativity," he told Vrasidas Karalis who, as a young translator of White’s work into Greek, spent years engaging in discussion with Lascaris at his home in Sydney’s Centennial Park. "The most paradoxical thing in love is not that you love, but that you have been loved, knowing all your deficiencies, your inner ugliness, the imperfections of your body…someone feels that this is good and beautiful! And the story begins. You enter his home and there is a plate on the table for you. You turn to your host with tears of gratitude," said Lascaris. Of his relationship with White: "I was his frustration and his inspiration, his confusion and his serenity…I lost myself as he was trying to discover me."